Preheat oven to 160ºC (320ºF). To make the caramel syrup, place the butter, sugar and water in a saucepan over medium heat and stir until the butter is melted and the sugar is dissolved. Set aside. Place the butter, sugar, eggs, almond meal, flour, baking powder, milk and vanilla in a bowl and mix until combined. 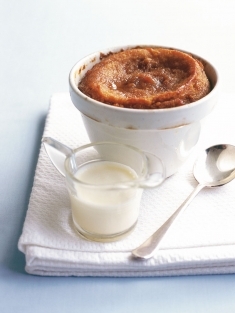 Spoon the pudding mixture into 6 x 1 cup-capacity (250ml) lightly greased ovenproof dishes. Pour over the caramel syrup and bake for 30 minutes or until cooked when tested with a skewer. Allow to stand for 5 minutes before serving with cream. Makes 6. Hi, I tried this tonight exactly however it the pudding turned out fine, but sauce was like soup and hence it didn’t look anything like the picture - tasty but what did I do wrong ! Was the sauce meant to be 1 3/4 cups as it seems way too much.